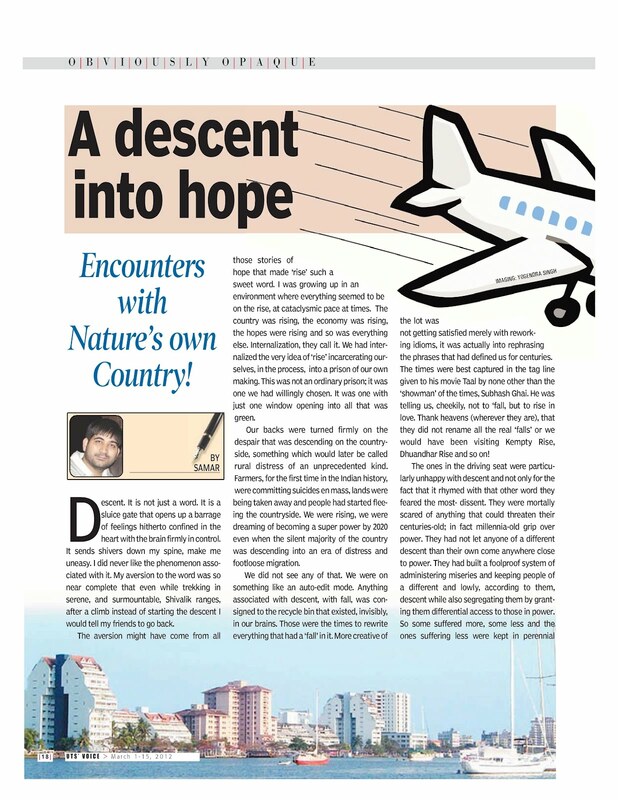 A descent into hope: Encounters with Nature’s own Country! Descent. It is not just a word. It is a sluice gate that opens up a barrage of feelings hitherto confined in the heart with the brain firmly in control. It sends shivers down my spine, make me uneasy.I did never like the phenomenon associated with it. My aversion to the word was so near complete that even while trekking in serene, and surmountable, Shivalik ranges, after a climb instead of starting the descent I would tell my friends to go back. The aversion might have come from all those stories of hope that made ‘rise’ such a sweet word. I was growing up in an environment where everything seemed to be on the rise, at cataclysmic pace at times. The country was rising, the economy was rising,the hopes were rising and so was everything else. Internalization, they call it. We had internalized the very idea of ‘rise’ incarcerating ourselves, in the process, into a prison of our own making. This was not an ordinary prison; it was one we had willingly chosen. It was one with just one window opening into all that was green. Our backs were turned firmly on the despair that was descending on the countryside,something which would later be called rural distress of an unprecedented kind. Farmers, for the first time in the Indian history, were committing suicides en mass, lands were being taken away and people had started fleeing the countryside. We were rising, we were dreaming of becoming a super power by 2020 even when the silent majority of the country was descending into an era of distress and footloose migration. We did not see any of that. We were on something like an auto-edit mode. Anything associated with descent, with fall, was consigned to the recycle bin that existed, invisibly, in our brains. Those were the times to rewrite everything that had a ‘fall’ in it. More creative of the lot was not getting satisfied merely with reworking idioms, it was actually into rephrasing the phrases that had defined us for centuries. The times were best captured in the tag line given to his movie Taal by none other than the ‘showman’ of the times, Subhash Ghai. He was telling us, cheekily, not to ‘fall, but to rise in love. Thank heavens (wherever they are), that they did not rename all the real ‘falls’ or we would have been visiting Kempty Rise, Dhuandhar Rise and so on! The ones in the driving seat were particularly unhappy with descent and not only for the fact that it rhymed with that other word they feared the most- dissent. They were mortally scared of anything that could threaten their centuries-old; in fact millennia-old grip over power. They had not let anyone of a different descent than their own come anywhere close to power. They had built a foolproof system of administering miseries and keeping people of a different and lowly, according to them, descent while also segregating them by granting them differential access to those in power. So some suffered more, some less and the ones suffering less were kept in perennial enmity with those suffering more. Then came democracy, the wretched thing that the ones in the driving seat hated the most. They were never the only ones who were enterprising enough to keep all others in subjugation, but they were the only ones with the right descent! Their lineage was their claim to power. Democracy changed it all. It gave the enterprising ones in the hitherto depressed castes and classes that formed the silent majority of India, their first shot on reclaiming all that had been snatched away from them. Soon, a new class of leadership emerged,and this one stunned the former rulers with their rustic charm. Like Lalu Yadav they came riding not on chariots but buffaloes and endeared themselves to the masses. They spoke a language that was shunned by the elite. They took pride in their surnames that were considered to be lowly till the other day and displayed it on everything that belonged to them, right from their cars to official bungalows. They had started infusing a sense of pride in their people, who were not even human enough for the previous regimes. They realized the power of their numbers and put it to some real good use. In a democratic system that operated on the principle of first past the post, the strategy was destined to good dividends and so it happened. They had drawn their first blood and it was to be merely followed by more successes. Ah, the master collaborators had lost the plot for good. Undoubtedly, they remained at the helm of social and economic life of the nation but their hold on political power was gone. But then, losing control over political power leads to loss of economic monopolies doesn’t it? Now, the hierarchy imbued in castes and surnames has met its nemesis and lineages stood staring into inevitable defeat. The phenomenon of descent has started its descent into doom. The rulers, previous ones I mean, were bound to hate the word more than any other. But then, people and communities do grow up. Okay, I concede that there are fanatics of all hues and cry, saffron ones being the most dominant one in our country, who have refused to do so but then I was talking of people, the human beings, wasn’t I? After all, expecting traits that are essentially human from people who take pride in calling themselves an army of monkeys, aka Bajarang Dal is our fault, not theirs! They have chosen to descent into precivilization barbarianism so let it be. Descent, I have realised, was not that negative a word. The only descent I still had a problem with remained that of an aircraft I was flying in. Believe me, every announcement of us approaching the airport and starting our ‘descent’ gave me goosebumps. My ears would hurt much before the plane begins to lose height and there are real changes in the air pressure inside. The physical uneasiness would then slowly convert into psychological wanderings like what to expect of the place. And most of all, the lights glittering out of the city life would inevitably make me think of millions of those who are yet to know what electricity really is. In short, the same city which looked so fascinating, so inclusive from changes when seen from a landing aircraft. Further, aerial views almost always killed the ‘character’ of the city beneath. All those beautiful streets that defined it, the crowded lanes which set the pace of its life get whitewashed by the high mast floodlights. You could no longer make a Banaras out of New Delhi and Phnom Penh and Hong Kong looked exactly the same. The descents, for me, butchered the persona of the city. They were all so different, yet so similar. Not this time though. I had listened to the pilot’s announcement of our impending descent with all the disquiet it evokes for me, and the disquiet had, almost instinctively,made me peep out of the window and into the city I was going to be in for the next week. I was stunned, in fact, that is still an understatement of what I really felt about. Where had all those high-rises gone? The failure to locate a single ugly thing otherwise called as residential tower was something as exhilarating as confusing? Were we landing in the right city? Had our plane, somehow, been diverted to some other place? The fears were almost immediately allayed by the second announcement of the pilot. We actually were going to land in Kochi, a town that looked like an ocean of green from that height. I had never had a descent more beautiful than that. It was a moment of revelation, a moment when truth gets somehow illuminated with all its magnificence. It was, in the words of Virginia Woolf, a moment of being. I was not bothered if Kerala was God’s own country or not anymore. It was Nature’s very own beyond doubt. I knew, intuitively, that I need to brace up for all those encounters with beauty that were in the offing. In any case, the drive to Thrissur was going to throw many of them at me. The city(or villages? 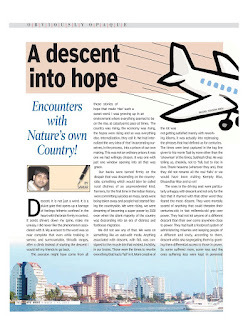 )Just out of the Kochi international Airport has a distinctive old world charm. The FM radio in the cab was put to some channel belting out melodious Hindi songs of the 1970s, and before I could even wonder about a Malyali listening to Hindi songs Purushottam bhai, the driver, has shot his first question at me, ‘Aap kahan se aaya Sir? My encounters with the hospitality Kearala is famous for had begun. This is not to suggest, though, that I had much time to think about hospitality. The road was narrow, and serpentine despite being in the plains. It was spotlessly clean too, defying North Indian logic system of mine. Clearly, Red in Kerala has always flied high and was not supposed to be seen as stains on the road, as it is in Pan-loving-roads-dirtying North Indian order of the things. Then, it opened up to the National Highway. This one, too, was nothing like the ones we have here. The drive was unbelievably smooth and there were no ‘horny’ men honking behind. They waited, patiently (they really did) at the Toll Plaza as well. Two hours in Kerala and I was already into my third shock. I was in Thrissur now, a temple town which seemed to be irrevocably obsessed with gold, cleanliness and Mundu (the wrap on clothe for men). Everyone seemed to wear them, and they, in turn, seemed to emerge as a challenge to class differentials otherwise so unabashedly manifested by the style of clothing. Thrissur, in fact Kerala, did not seem to bother much with class. I concede that there must be some remnants not accessible to my untrained eyes but then it must be doing far better than rest of India even in that case. Sri Narayan Guru, Indian Social Reformer but understood it only that day. Replacing God with the image of one’s own was something like instilling the idea of divinity among those who were condemned to live in a perennial dehumanized state of being. This was like reclaiming humans out of those destined to slavery based on their descent. On top of all that, it was achieved by subverting the very idea of divinity. I was in God’s own country,just that the Gods here were more human than the Gods themselves. Here, the brokers between the supposed divinity and their human devotees had been done away with. If only we could repeat the experience in the North! Navin wanted me to roam around the streets, especially in the area called city-centre. City center is a circular drive concentric with the temple and houses everything from swanky automobile showrooms to eateries. I signaled an auto-rickshaw and asked him for taking me there. So he did, and the meter said 13 rupees! 13 rupees in all! This was going to remain the same over my 6 days spent in the temple town. I got fleeced just once, that too when the guy charged me 40 rupees, and having become an auto-rickshaw veteran I knew that was overcharging by a margin! Think of it, just six days in Kerala and I was shocked at getting fleeced and not the other way round! Decent too rhymes with descent, remember? However, I could sense that there was something more than was meeting my eyes. And then, it dawned upon me. Most of the eateries, including my all-time favorite Indian Coffee House, were selling both pork and beef together with all other vegetarian and non-vegetarian delicacies. And one did not really need to be a rocket scientist to see that their patrons consisted of all religious groups. Selling beef in a country where Giriraj Kishors of Vishwa Hindu Parishad keep declaring life of a cow being more important than that of a Dalit was a revelation in itself, it sharing space with pork was a lesson in pluralism. I was in God’s own country, but this God was not the regular one. If only, we could import this virtue of respecting everyone’s preferences including the culinary ones without deploying religion as a menacing weapon of making others conform to our worldviews! Whoever this ‘our’ is! I had cancelled my plans of visiting the temple. One does not need Gods to streamline affairs of a community of human beings, does one? And yes, I was bewildered that no one seemed to be particularly interested in my surname, aka caste! No one looked at me with curious eyes and a pause when I introduced myself with merely my first name. No one seemed to stop or repeat that in a last-ditch effort of extracting out my surname (and my caste with it). I am sure that there may be remnants of caste as well, but then they certainly would not be of that order as in the North. Thrissur seemed to have quite a large number of North Indian migrant labours easily distinguishable from the locals both for their complexion and the pants instead of the Mundus. They looked happy, not in the least for there are no menaces like Raj Shrikant Thackerays here threatening them to go back or facing the consequences. You see, descent is not much of an issue even in political life of Kerala! God’s own country it is or not, Narayana Guru’s it is. I was thinking, on my flight back, of when would we have our own Keralas?